Interests - Cheerleading, gymnastics, having fun with friends when well enough, clothes, shoes, music and concerts, One Direction. 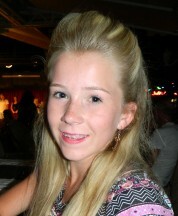 Emily was diagnosed with Cystic Fibrosis in 2007 aged 8. This was a shock to us and as a family as we knew nothing about this disease then. Emily has to have physio twice a day and she takes up to thirty to forty tablets a day plus 5 nebulisers a day to help her lungs. Emily also has CF related liver disease and has to have a lot of scans to keep a check on her liver. Emily has a portacath fitted now and this makes her IV’s less traumatic for as she hated having long lines so much. We can do home IV’s for Emily when she is well enough so it is fantastic for her as she can carry on at school and do everything she likes as normal. Emily also has high calorie drinks everyday to keep her weight up and I must say she loves them but only chocolate flavour Calshake! Emily has 2 older brothers and 3 older sisters. Danielle is the only sister who is still at home. All love her very much and encourage her so much. It has been hard for us as a family with this diagnosis, but as a family we will get there and battle this with Emily. To everyone at Post Pals, as I am now 16 I feel that it is time for me to move on so that another new Pal can join and receive some lovely post like I have throughout the past few years. I just want to thank everyone for the letters, cards and amazing gifts, that I have been sent over the years. Me and my family have made some life long friends through Post Pals who we would love to stay in contact with! You all do an amazing job and it puts lots of happy smiles on us kids (and our family’s) at the darkest of times. Thank you once again for everything! Thank you to everyone who has taken the time to send letters, notes and gifts to Emily. It has meant a lot to her (and to us as a family) to think people out there do care. It’s been a tough few months for Emily so I’m sorry we haven’t been keeping you up to date with everything recently, but hopefully we will be back to normal with Emily’s posts soon. Thanks again. Emily hasn’t been too well for the past 3 weeks since we came back off holiday. She’s had two lots of oral antibiotics to try to clear a nasty cough but it has done nothing and all she’s wanted to do is sleep. She had clinic a few days ago with her consultant and Prof David who comes every few months to our clinic, there was also CF nurses and lots of other people there – just a busy clinic. Emily’s consultant was going to change her oral antibiotics to see if that helped her for now but the Prof said NO he said she was better to start IV’s. Emily wasn’t too happy about this as it has only been 7 weeks since she last had her IV’s but that’s the plan. She starts them on Tuesday 1st October and finishes them on her birthday 15th October – what a birthday present! Thank you to Claire for her parcel, she received it today and she will take this into hospital with her on tuesday! Thank you to everyone who is taking the time to make my lovely daughter smile! Thank you Post Pals for being there this month, especially for Emily and Faith, after they lost their lovely friend Lizzie. You have been amazing, as always! Thank you for all the lovely letters Emily received this month, they really did put a smile on her face! Everyone has been so kind, it really does mean a lot to Emily and to us too! Thank you. Emily has been through a lot this month with her Iv’s and also having her tonsils out. She has been great though and never complained at all. Her operation went really well to take her tonsils out and she was so brave – we even got pictures from her surgeon of her tonsils, yuck! She has been in a lot of pain trying to eat though and she couldn’t go out or go to school for 2 weeks so she did get very bored. She is so glad she’s had it all done and is back at school now though and has her lovely smile back on her face. Thank you Post Pals for the lovely parcel you sent Emily, it really cheered her up while she was recovering from having her tonsils out. Emily’s has had her tonsils removed, she has been in a lot of pain and is also on her IV antibiotics, so she’s really not having such a great time at the minute. Emily’s not allowed out for two weeks in case of infection. Emily hasn’t been doing very well at all, she’s had a lot of chest infections and tonsillitis so has missed a lot of school the past month as she has been so low. Today she went into hospital to start her IV antibiotics and also have a Glucose Tolerance test to check she doesn’t have diabetes. Then after her first week of IV’s she is having her tonsils removed (on the 11th) then after that continue her last week on IV’s… so please keep Emily is your thoughts and maybe some happy post would be lovely to cheer her up. Thank you! Emily’s just getting back on her feet after breaking her ankle – the worst thing ever for her as she couldn’t even go into school because she couldn’t weight bare at all, so it was a very long few months. She is now back to dance classes and back to cheerleading so we have a happy Emily again! At the minute she is having a bad time though with tonsillitis yet again, I think this is the 7h or 8th time now, but this time she is being referred to E.N.T. so let’s hope they get her in and take them out as it stops her having her nebs etc. Emily is due her IV’s over Christmas and new year, so we will be glad to see the back of this year, that’s for sure! Thank you to Alex, Natashja and Kerri for the lovely cards and parcels you have sent Emily this month, she has loved every one of them! Emily is off school again and on another 2 weeks of oral antibiotics as she’s just been so run down. We think she’s been trying so hard after breaking her ankle which isn’t right yet – she’s still walking with a limp and has only been back in school now a few weeks and that’s been since summer holidays, so she’s not had a great time at all. Emily loves receiving post! Thank you to Alex who sends her post, she’s such an amazing woman! Emily has been doing pretty well recently, but has had a few bouts of Tonsillitis so we’re waiting to see what her consultant is going to do about this. We seem to be going back and forth for antibiotics and she’s on her IV’s right now as she has a bout of it again. We are all really happy with her lung function and everything else though, so that’s all great! She’s been training lots with her cheerleading squad for a few competitions that are coming up soon and she even does all this while she’s on her IV’s, nothing stops her at all. We do her IV’s at home now so she can carry on doing all her activities including her dancing. Emily’s just so active and loves to be like this while she feels well enough and its great for us to see too! She’s doing so well in school and is going to Year 8 camp soon so that’s going to be great fun and an experience for Emily. Emily had a gift from Post Pals that was a monkey called Dave – we did have a laugh with him as Emily’s Dad is called Dave! Emily’s Iv’s didn’t go too well this time, it was a nightmare from the start as they didn’t have any beds to admit her and she had been unwell for over a week. Her specialist nurse and consultant wanted Emily to start her IV’s as soon as possible but we kept being told there were no beds. In the end Emily’s consultant had us bring Emily into hospital for a few hours to have her gripper put in to start IV’s then she could go home after a few hours. However this never happens as they like to keep an eye on her over night to make sure everything is ok and she gets to see physio etc, but with this bed situation Emily’s consultant didn’t want her to wait any longer as she wasn’t 100%! Well, IV’s started and we got home, but that night Emily started complaining of pains in her port site, so we could only give her some painkillers and make her comfortable until the morning when we then rang the hospital to tell them. We were told not to worry and someone would get back to us. So we waited and the pains didn’t go away… so we called again, but still nothing. We had to just keep giving pain relief to Emily and after 2/3 days we spoke to her specialist nurse and explained what was going on and she contacted the consultant. We had to take Emily up to hospital and they just had a look and made sure it was flushing ok etc but we had already said that it was. The pains never went away and Emily was so unhappy, she didn’t want to do anything and days were passing by and we just felt so useless. Then we had another bad night with Emily up all night so we’d had enough and called them again in the morning. They had us go back again and this time they X-rayed her port site and also put a dye through to make sure there were no blockages. As we had told them before though, her port had been flushing and was drawing back fine so we didn’t think it was a blockage, but it was best to check it out, as we were baffled with Emily’s pains. A few more days passed and Emily couldn’t cope any longer so we went back and they decided to change the gripper and tried putting another in but that failed and it bent going in. By this time Emily was hysterical and wouldn’t let them near her again (this was day 9 of her IV’s so she had put up with enough really). We saw the doctor on duty and he said it looked like the antibiotic had irritated her vein which caused the pain. This has never happened before to Emily and we really hope it doesn’t happen again either. The doctor had to put Emily on some oral antibiotics to cover the rest of her IV’s as she hadn’t finished the course! It took almost a week for the pains to go after all that but it was so good to see Emily back to normal and having her lovely smile on her face again! Thank you for all of Emily’s post. Emily has had some lovely mail from Alex Stiles Welch, she has boosted up Emily’s mail so much recently, it’s so lovely. You all do such amazing jobs to bring smiles to our kids, we can’t thank you enough. Thank you all very much! We had an appointment to see Emily’s liver specialist in Manchester a few weeks ago. We have always known that her spleen was enlarged because of her liver disease, but today we found out that her platelets are dropping because of her spleen and if this carries they have no option but to remove Emily’s spleen. We are hoping that this takes time and things slow down as they couldn’t put a time on how long this could take etc, so at the minute they will take regular blood tests when Emily goes into hospital for her IV’s. Right now all we can do is hope her count stays where it is at now… that was 99, so fingers crossed! 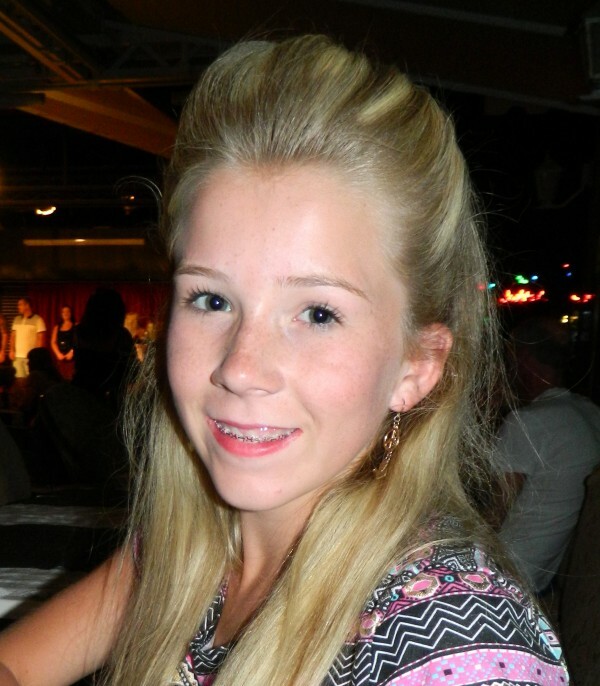 Emily now attends a dance school and does Tap, Ballet and Contemporary. She had her first ballet panto last weekend and made us very proud. Emily’s not been too bad this month. She’s had a lot of hospital visits and different tests being done this month, GTT test, liver scan, x-rays, lung function. We just hate waiting on results. She’s been doing well in school and had her school report at the end of the month. We were really pleased with her straight A’s and 2 B’s in effort. Well, we can’t ask for anymore than that from her and we’re so pleased for her. We just hope she can keep it up and maybe have a few months break so she can stay well to stay in school more. Emily had a bad run up to Christmas as she just had no energy and was coughing constantly. We took her up to hospital one night as she couldn’t breathe properly. Her chest was tight and they put her on some oral antibiotics for 2 weeks but that didn’t really do much to help. Emily also had a cheerleading competition coming up and she was determined she was going do this. We spoke to her consultant and he is all for Emily doing her activities, so he said she could go ahead with this competition and then they would admit her early to start her iv’s. Emily did so well at her competition and her team came home with 15 trophies, so she was very happy. Emily then went into hospital to start her iv’s and once they started to work we all had a lovely Christmas and New Year. Emily has been off school and under the weather after having her cervical cancer jab a few days ago and then yesterday her flu jab too. These have made her feel unwell so she’s been busy doing her Christmas cards for Post Pals. Emily loved all her cards she received for her 13th birthday and it made it even more special for her, so thank you all again. She also loved her Halloween gift pack that she got in the post, it was really lovely. Emily hasn’t been too well again this week so we had another visit to hospital. She has a viral throat infection and was given some oral antibiotics and spray for her sore throat but her chest was clear which was good news. We’re so pleased about that as it is Emily’s birthday on Saturday and she is having a massive party with all her friends and a limo with her close friends, so I’m sure she will be back to herself by then and have loads of fun. She is very excited about it all now! We’re not having a good time at the minute with Emily as she’s been off colour quite a lot and is now on more oral antibiotics. It is not that long since she finished her iv’s either so she seems to be at home a lot at the moment. Emily is off school ill again at the moment. We took her to our hospital to be checked out and she has an ear and throat infection which is making it hard for her to breathe properly. The post she has been getting has made her smile though so thank you all. I would like to say a big thank you to Nichola, Jon & Daniel W, for the beautiful card Emily-Jo received today, it’s just what she needed as she has been off school unwell the past few days and she just finished her iv’s too so she’s just resting now and getting better.